As you’ve no doubt heard by now, Alex Rodriguez may have to withdraw from the WBC due to a hip injury. You never like to see such a high-profile player go down to injury, but my thoughts immediately turned in a different direction than most people’s. If Alex Rodriguez misses the WBC, does this make Miguel Tejada the Dominican Republic’s starting third baseman? Tejada withdrew from the Classic after hearing a rumor that he was going to be used primarily as a first baseman. Then, with manager Felipe Alou’s eventual assurance that he would play shortstop, third base, and DH, he changed his mind and joined the team. With Rodriguez in the lineup at third, and Jose Reyes and Hanley Ramirez at shortstop, it wasn’t immediately clear how much playing time Tejada would get in the infield. Now, that’s all changed. Barring whomever would replace A-Rod on the roster, the only other third baseman currently with the team is Willy Aybar. Given that option, it seems reasonable to assume that Tejada would become the starting third baseman. And that, as far as I’m concerned, is a problem for the Houston Astros. I’m generally pro-WBC. I don’t mind players taking the added injury risk to play for their countries. LaTroy Hawkins, Roy Oswalt, and Carlos Lee are all involved in the classic, and bully for them. These are three guys who performed for the Astros last year. They did exactly the job they were asked to do, and they did it well. But Tejada’s short tenure with the Astros has been tumultuous, at best. First, he was caught lying about his age. Then, he suffered a mid-season slump that hurt the team in a bad way. Next, he was indicted for lying to federal investigators. Then came the WBC. Simply put, I feel pretty strongly that Miguel should be in camp. He should be getting reps as a shortstop. He should be preparing himself to earn the money he’s getting paid – an albatross contract, signed under false pretenses regarding his age. That contract, and the five players we gave up to get Tejada from the Orioles, could be singled out as the single-largest reason the Astros were unable to make a move of any merit this offseason. The news that he may get significant playing time at another position doesn’t sit well with me. Of course, there is another option, given the Astros’ holes at third base. If Tejada shows himself to be a competent third baseman, perhaps Coop may consider moving him there permanently, and allowing either Tommy Manzella or Drew Sutton to play shortstop, assuming Chris Johnson is sent to AAA at the end of Spring Training. The big question for the Houston Astros this offseason may well be: Can this team compete this year? We’ve all heard the naysayers. Baseball Prospectus recently released their 2009 PECOTA rankings, projecting us as the fifth place team in the NL Central, with 98 losses. The good news: Historically, the Astros tend to out-perform their PECOTA rankings. They also tend to out-perform their Pythagorean W-L%. In 2008, we outdid PECOTA (74-88) by 12 wins, and our Pythageorean W-L% (77-84) by 9 wins. This could be viewed as a positive, of course, but it could also be viewed as a false positive. Giving fans hope beyond expectations heading into the 2009 season. When you look at this team, not a lot distinguishes it from the 2008 San Diego Padres after Chris Young went down: One of the best aces in the game (Peavy/Oswalt), a good-hitting first baseman (Berkman/Gonzalez), a good corner outfielder (Lee/Giles), a streaky but overall above average shortstop (Greene/Tejada), a patchy starting rotation made of largely of “maybes,” a decent ‘pen with a top-notch closer (Hoffman/Valverde), and not a lot off of the bench. That Padres team put together 99 losses. This Astros team is predicted, by PECOTA, to lose 96 games. I don’t say this to be a naysayer at all. Like most Astros fans, I will still live and die with each game. I will still cheer just as loudly for each win. I will still try to put a positive spin on even the worst game. But it’s important to be realistic, and with that in mind, I believe it’s time to see what the youngsters can do. 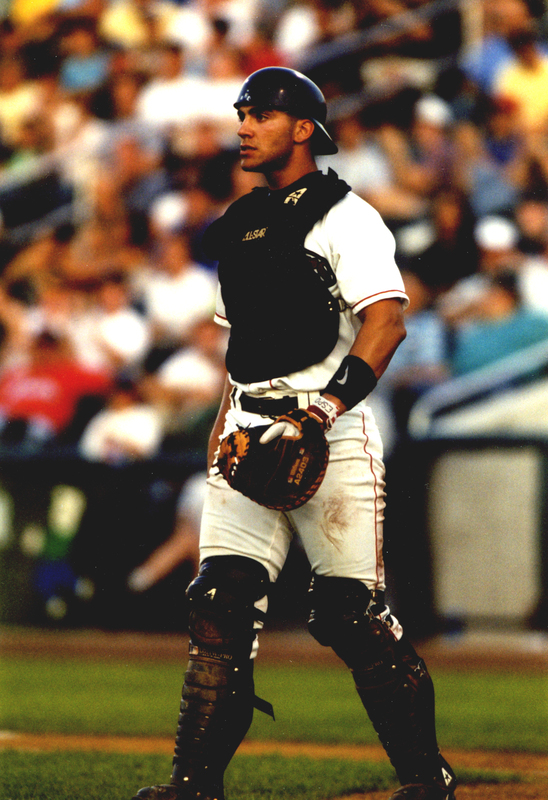 C Lou Palmisano – The catcher position is an awkward one for the Astros. They actually have a pretty decent stockpile of talent at the position, at least in terms of quantity, but not a lot of quality. That situation wasn’t exactly remedied when the Orioles chose Lou Palmisano from the Brewers organization in the Rule 5 Draft and then sent him to Houston for cash. For those unfamiliar with the Rule 5 Draft, basically if you select a player, you must keep him on your Major League roster for the entire season. If you do not, he can be claimed off waivers by another team (who must then keep him on their major league roster) or return him to the original team. Palmisano is a promising offensive option behind the plate, but has yet to play above AA ball. Because of medical issues, he hasn’t played catcher in a game since 2007. Anything but a sure-fire major league prospect at the moment. Projection: With Toby Hall out due to injury, if Palmisano shows any promise at all at the plate, he will probably break camp with the big league team. Still, it’s hard to imagine Towles and Quintero both being sent down, and since catcher is one of the few positions with some organizational depth, I suspect Palmisano will be returned to the Brewers organization. 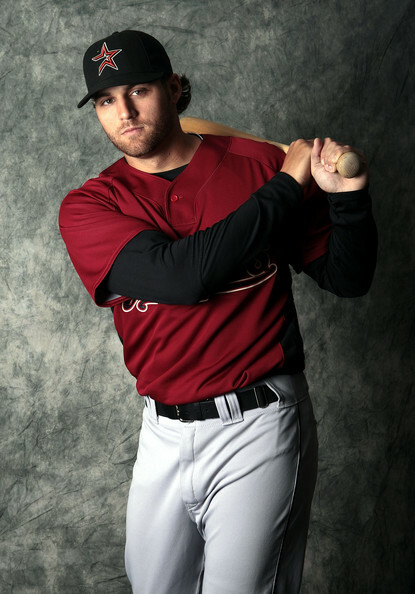 SS Tommy Manzella – Despite hitting a major bump when he got to AAA Round Rock, Manzella is one of my favorites among the Astros’ minor league players. His Round Rock line is anything but impressive: .219/.273/.294 in 228 at-bats, but his 2008 line in AA Corpus Christi was .299/.346/.446 in 224 at-bats. He’s improved his defense, and with a good spring and a few more months of AAA ball, he could well be poised to step up and claim his place as the Astros’ shortstop of the future. Projection: Manzella will wear a Houston Astros uniform this season. 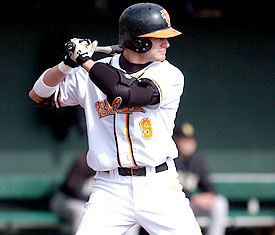 Expect him to make the club sometime in late May or early June and compile somewhere in the vicinity of 100-120 at-bats. SS Edwin Maysonet – Maysonet is a versatile infielder – he’s mainly played the shortstop position, but has also played a lot of second base, and has occasionally been asked to fill in at third and in the outfield. He’s shown remarkable consistently through the minors, clocking in right around .260/.330/.360 each season. Last year at Round Rock, his line was .271/.343/.379. Nothing that will blow anyone away, and his glove isn’t the best in the organization, either. Still, he’s a serviceable-enough backup infielder. Projection: Maysonet will likely be pressed into service at some point this season, but don’t look for anything more than 50 or so at-bats. 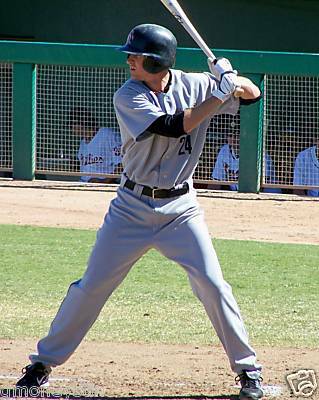 2B Drew Sutton – Sutton is a promising young infielder who plays primarily second base, but also third. 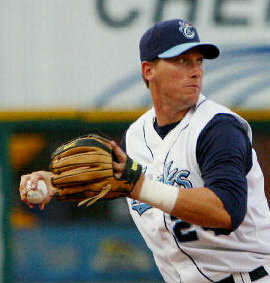 He has yet to make a plate appearance at any level above AA, but his 2008 Corpus Christi line sure does look good: .317/.408/.523 with 20 stolen bases in 27 attempts, 20 home runs in 520 AB, and 76 walks to 98 strikeouts. His glovework isn’t dazzling (16 errors in 99 games), but he’s one of the better prospects currently in the organization. Projection: With the revolving-door that third base promises to be this season, as well as Kaz Matsui’s inevitable injury woes, Sutton figures to see the big leagues. I don’t know that I’d expect him to perform extraordinarily, but don’t let that put you off. He may be a year or two away, but expect Sutton to continue to do well in the organization. 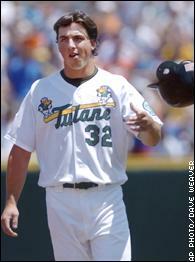 SP OF Brian Bogusevic – The Astros drafted Bogusevic as a position player out of Tulane University, then moved him to the pitching mound, where he struggled, never posting a season ERA under 4.61. 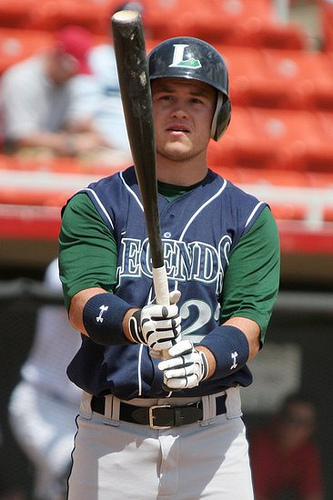 He’s since been moved back to the outfield, and has responded by becoming one of the Astros’ highest-rated prospects, thanks largely to his .371/.447/.556 line in 124 at-bats at Corpus Christi in 2008. In case you’ve never heard of “baseball” before, that’s pretty darned impressive. Projection: Bogusevic hasn’t played above AA yet, but expect a meteoric rise through the system this year. With so many questions in the Astros’ outfield, I expect him to get some time at the big league level, perhaps even breaking through as a starter late in the season if there are injuries to Lee or Pence. OF Yordany Ramirez – With the unfortunate departure of Jordan Parraz in the Tyler Lumsden trade, Ramirez and 17-year-old Jay Austin may be the two best “fast guys” in the Houston Astros organization. Ramirez didn’t have a stellar year at Round Rock in 2008 – in fact, it was pretty lousy (.231/.254/.382). But he’s shown flashes throughout his time in the minors, and he’ll be 24 this year. He was widely-regarded as the Padres’ top defensive outfield prospect, has stolen 108 of 140 in his minor league career, and just happens to play centerfield, a position of need for the Astros. Projection: It’s tough to know which Yordany we’re going to see. If he can strike out less and walk more (he has 67 career minor league walks to 322 strikeouts), then the sky is the limit. As it is, he projects as another Michael Bourn type. I’d love to think either of them is going to turn it around this year, but I’m not overly optimistic. C Jason Castro – Since I became an Astros fan in the mid-eighties, I can remember four times when I threw my hands up at an Astros’ draft choice. It all starts with the time we made Phil Nevin the #1 overall draft choice… ahead of Derek Jeter. Second was when we took catcher Max Sapp over Joba Chamberlain. The third-most egregious pick, in my opinion, was when we selected Mike Rosamond ahead of Carl Crawford. Last year’s selection of Jason Castro, a contact-hitting lefty catcher out of Stanford University, ahead of switch-hitting first baseman Justin Smoak, may well break those ranks. I’m reserving judgement for now, but I have to say that every time I see Astros fans pinning the hopes of the team’s future on Castro, who went .275/.383/.384 in 138 at-bats at Short Season Tri-City. He inexplicably received a Spring Training invitation this year, and has definitely been tagged as the catcher of the future. Oh, and Smoak? .304/.355/.518 for Texas’s Midwest League affiliate, the Clinton LumberKings. Projection: Don’t expect Castro to play in the big leagues this year. He’ll need to prove himself over the course of a full minor league season first, and the Astros have plenty of depth at the catcher position. 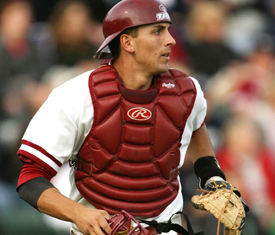 C Brian Esposito – Esposito will be 30 years old coming into the 2009 season, and has amassed a grand total of one inning of major league experience since being drafted by the Red Sox in the 5th round of the 2000 draft out of the University of Connecticut. The Astros are his sixth organization in the past nine seasons, and he’s likely to start the season in Corpus Christi, his twelfth team in that same nine seasons. In that time, he’s put together an unimpressive .214/.251/.305 line. The fact that he is in Spring Training this year, instead of a more-deserving candidate like, say, Eli Iorg, is a testament to the Astros’ trainwreck of a catching situation. Projection: Esposito will not play as an Astro this season. 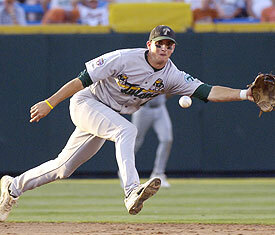 C Lou Santangelo – In 2008, 109 baserunners tried to steal a base against Santangelo. 34 of them were caught. And that sums up Santangelo behind the plate. At the plate, he generally registers in the .240/.310/.420 mark, though he did hit a major speed bump in limited play at the AAA level last year. At the moment, he shouldn’t be considered a big league catching prospect, and only makes this list because he received a Spring Training invitation. Projection: Santangelo may actually be pressed into service at the big league level to protect Castro from being rushed, but not much should be expected of him. he hit a bit of a speed bump to the tune of .218/.252/.287 in just 101 at-bats. I think with a full year of AAA behind him, he could be a legitimate starting option at third base in 2010. He needs some work defensively – 23 errors in just 230 chances isn’t exactly sound – but I’m confident he’ll do whatever it takes to get to the big league level. Projection: Johnson will likely see some time in the big leagues this year, with the large question mark surrounding third base in Houston, and may post some decent numbers. I still think he’d be better served with another year of seasoning and serious defensive work – or even a move to first base. 3B Mark Saccomanno – It’s no surprise that I’m a big Mark Saccomanno fan. He led Round Rock in home runs (27) and total bases (275), and was in the top five in doubles (33), triples (2), RBI (84), SLG (.521), and… er… errors. In fact, his 24 errors was 11 more than Maysonet, who was second with 13 at a tougher position. In fact, only Tacoma’s Matt Tuiasosopo had more errors in the PCL with 27. So make no mistake: Saccomanno is a butcher in the field. But his stick is something to be reckoned with, even beyond the fact that he turned the very first big league pitch he ever saw – an Ian Snell fastball – into a home run. Projection: Saccomanno should find his place as the everyday starter at third base by late May, and aside from ceding some late-inning defensive innings to Geoff Blum, should see a lot of time there. I expect a big season from him. OF Eli Iorg – If Eli’s name sounds familiar to you, it should. His father, Garth, played for the Blue Jays for nine seasons from the late eighties to the late nineties. His uncle, Dane, played outfield and first base (and even pitched three innings!) for the Phillies, Royals, and Padres – but mostly the Cardinals – over the span of 10 seasons from 1977-1985. His brother, Cale, is a shortstop in the Tigers’ organization. As for Eli, he’ll be entering his fifth season in the Astros minors, and has put together a nice little .274/.325/.450 line in his time at Greeneville, Lexington, Salem, and Corpus Christi. Projection: Eli’s been moving right along, and should start the season in AAA Round Rock. I do think he has an outside shot at cracking the big league squad this season, and I’m pretty confident he’ll rise to the challenge. Definitely one to watch. C Koby Clemens – Clemens started life in the Astros organization as a third baseman, but in 2008 he was moved to catcher, because apparently someone thought that there wasn’t enough depth at that position. 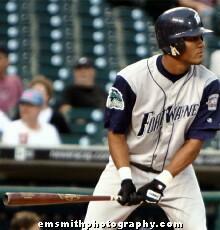 He hasn’t exactly exploded offensively, but in 2008 with Salem, he put together a very respectable .268/.369/.423. He threw out 45 of 130 basestealers (meanies, picking on the new catcher) – 35%. Not bad, all things considered. Projection: I actually wouldn’t be too surprised to see Koby crack the big leagues at some point this season, but I do expect he’ll spend the majority of the season between Lancaster and Corpus Christi. Up next: The fresh-faced pitchers.